A single Ohio school district will receive more than $42 million in tax revenue from a single new natural gas power plant, according to local school officials in Guernsey County. Again — this is just one school district benefiting from a single natural gas power plant project. 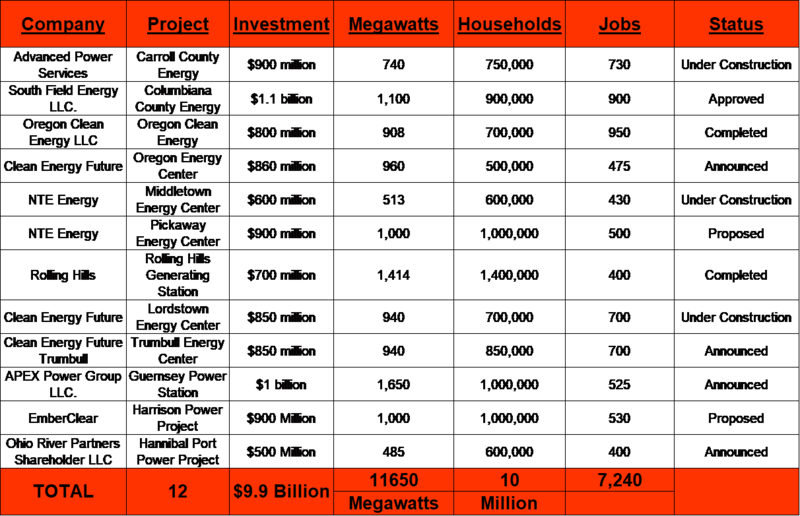 There are currently 12 natural gas power plant projects in various stages of development in Ohio. So once completed, these projects will not only power more than 10 million households, but also provide millions to local schools and around the state, as the above examples illustrates. For a quick recap of where things currently stand with the status of natural gas power plants slated for Ohio, here’s a quick snapshot. As EID reported in August, the newest of these projects is the recently completed Oregon Clean Energy Center, located outside of Toledo. As you can see in the chart above, the project employed 950 construction workers during its peak and retains about 20 permanent workers full-time. What’s more is that it will add $20 million to the local economy on an annual basis for years to come and pump millions into the local school district. As Gov. Kasich said, “This is a big deal,” and school districts across the state who stand to benefit financially from these new gas-fired plants would certainly agree.